First, I assume that you have Dreamweaver with the AIR extension installed. Next I assume that you know how to create the AIR runtime. If you want to debug this then you should have the AIR SDK present on your machine – debugging is out of scope of this article but will pen some notes on how to do it at some point. You will notice that the first SCRIPT tag references AIRAliases.js (available in the “frameworks” folder within the AIR SDK) – this is necessary only if you are using the shortcut reference to AIR specific methods/functions, which I am. Next you will notice the second SCRIPT tag with the reference to “servicemonitor.swf” (also available in the AIR SDK). This second file is an ActionScript library that encapsulates the service monitor framework which is separate from the AIR framework. This is designed to be left as-is, you configure it via its initNetwork method where you set your own function to be called when the network status changes. The getMonitorStatus method allows you to go get the network status whenever you want. As mentioned this inits the monitor, the following table describes the required arguments. URLtoMonitor String This is the URL to monitor. You could set it as ‘http://www.google.com’ if you are simply looking to monitor the network in general, or maybe it makes sense to use a specific URL so that you know if your web services are up or not. CallBackFunc Function This is your custom callback function which will be called each time the network status changes. A simple boolean is returned. IMO passing false here is a good idea. You can call this at any point to get the current network status. A little redundant yet maybe useful to some. This will return a boolean. 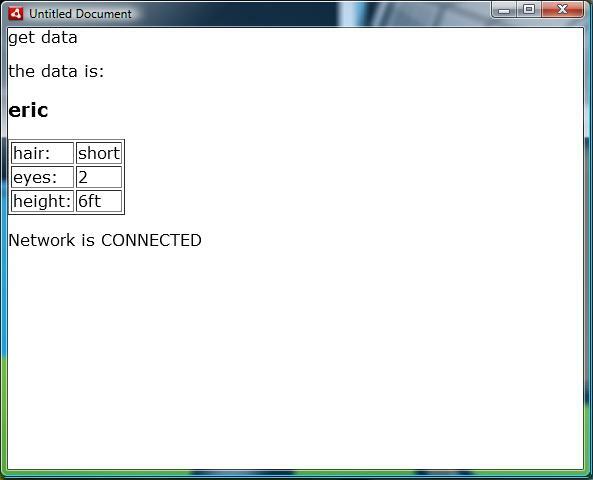 Lastly, if the variable “network” is reserved by your particular application then feel free to change it. Now, assuming you have all the other code in place and are looking at your AIR app on your desktop, simply enable/disable your network by unplugging your Ethernet or disabling WiFi. Give it a few seconds and you will see your app telling you your network status. 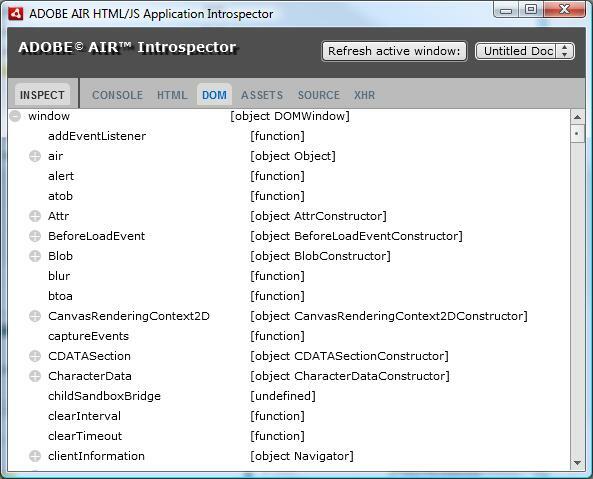 One of the very first things you will do when setting up your environment for developing AIR apps is learning to debug via the ADL – the Air Debug Launcher. This gives you rudimentary console logging within the command prompt and is a bridge to using the Flex debug tools (which I won’t cover). Beyond this is the ADL’s companion – the Air Introspector. The Introspector does some really cool things analagous to what WEINRE/Chrome does for html-based mobile app development. I’ll be talking about setting up the ADL and then will jump into the Introspector. Learning the ADL is necessary as the Introspector will not function without it. 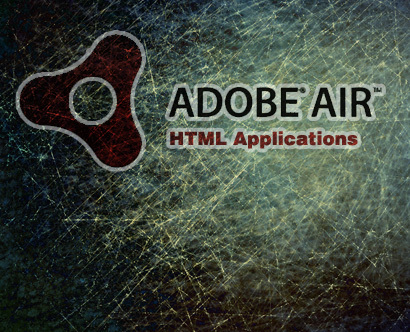 Click to download the AIR SDK. AIRAliases.js comes as part of the AIR SDK (located in the “frameworks/libs/air/” directory) which you should already have in order to run the ADL. Once you have the SDK and assuming that you know how to create AIR packages the first thing you will do is add an environment variable that points to the install of the ADL so that you can invoke it from the Command Prompt when needed. Next scroll down in the System Variables pane until you see the “Path” variable. Select it and then click the “Edit” button. At the end of the “Variable value” field you will want to paste/type in the path to the bin folder within your AIR SDK folder. For the sake of convenience whenever I download SDK’s I always keep them in the root of one of my hard drives so as to keep the path really short. Also, don’t use spaces in your folder names!!! Ok, so the path to my AIR SDK bin in this example is: E:\AdobeAIRSDK\bin – your path will obviously be different. Once you’ve entered the correct path click “Ok” and close the rest of the windows. Now lets assume that you have an AIR project in Dreamweaver to creatte the AIR file go to “Site > Create AIR file…” or hot the CTRL+SHIFT+B key combo. Navigate via the prompt to the root of your project. If you don’t know how to do this then do a quick google search to learn how; try searching for “Windows Command Prompt commands” – you’ll make heavy use of the cd command. TIP You may have a really long path to your project root – if so, simply keep the complete command and path in a text file. 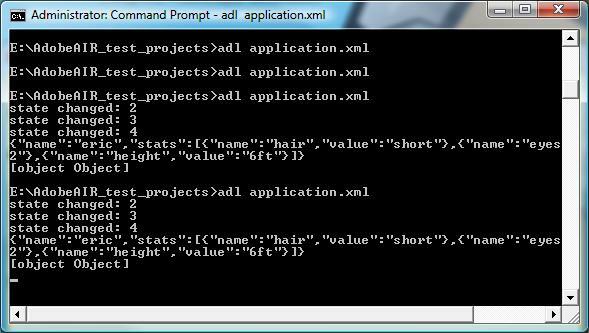 Then when needed copy the entire string and right-click the insertion point in your command prompt and choose “paste”. Your AIR App will now launch – DO NOT close the command prompt, you’ll need it as whatever you’ve traced inside your app will appear within the prompt. 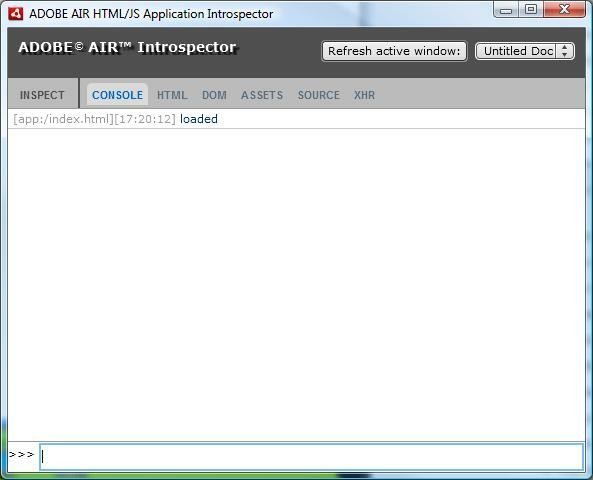 Basic debugging, yes, and sadly sans line numbers however the AIR HTML Introspector is another thing entirely…. It includes a tree view for DOM properties and functions. It lets you edit the attributes and text nodes for DOM elements. It lets you view to the initial HTML source and the current markup source for the user interface. You can search for matching text in the source code and files. Cool stuff, eh? Ok, lets walk through the set up. First you must add the AIRIntrospector.js file to your page. That file is located in the “frameworks/libs/air/” directory within your AIR SDK folder. NOTE Don’t forget to remove the AIRIntrospector.js from your production code! If you want the Introspector to appear every time you debug the app you can do so by calling one of the above within your app. For example, if I wanted to I could call air.Introspector.Console.log(‘loaded’) within my body load listener. 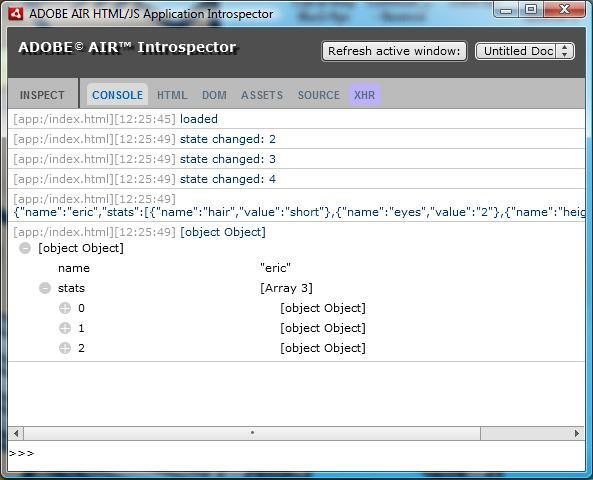 As in regular HTML development with Chrome you can send an object to the Introspector console and inspect its properties by expanding a tree representation of the object. As well, once the Inspector has launched you have access to your project’s DOM, assets, Source, XHR, etc – essentially everything you need in modern web development. One really needs to actually build something to demonstrate the Introspector properly, so…. I’ll do just that. I’ll build a small app that incorporates an AJAX call to a server, retrieves the JSON payload and updates the display. 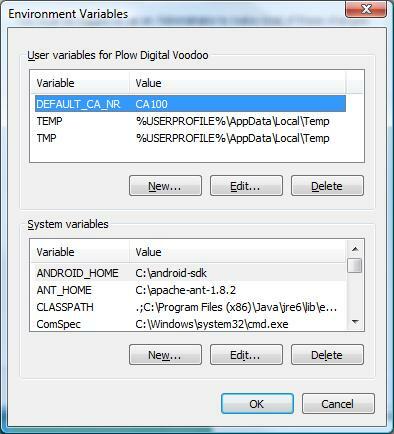 I will also add in my network detection code which you can read more about here. An aspect of AIR worth pointing out is that it severely limits network communication. Attempting to load external scripts will not work – you have to package all of your scripts within the root of your AIR Project. The one thing that Adobe has seen fit to allow though is the XMLHttpRequest() method which allows us to query servers and receive responses. You can see that I’ve included some logging merely for demonstration. Also, you can see that I’m checking for the existence of the AIR framework – thats because I tested this thing in Chrome before trying it in AIR and Chrome would throw errors because AIR doesn’t exist outside of the AIR runtime. So, console.log() is for regular desktop use while air.whatever is for AIR (of course). Ok, lets run the app and look at all the Introspector features. 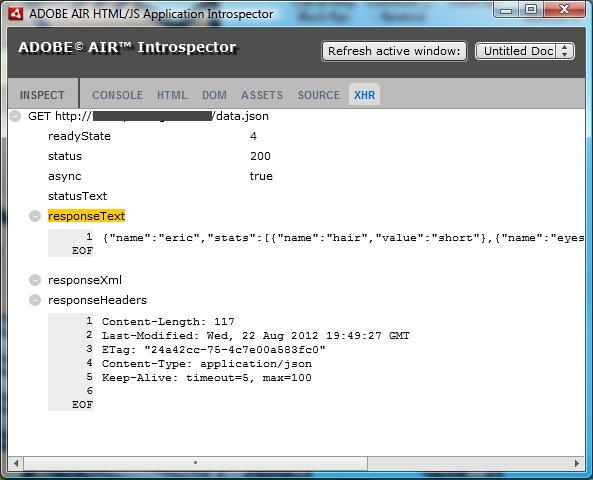 Note the logging statements and how the the JSON payload is treated as an object whose tree can be inspected.